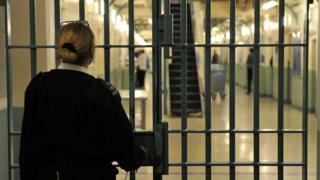 A group of elite prison officers were sent to deal with incidents in Welsh jails more than 50 times last year. These included hostage situations, prisoners climbing at heights or barricading themselves in. The Freedom of Information figures show they were called more than 600 times in total to prisons in Wales and England - a 60% increase in four years. A Ministry of Justice (MoJ) spokesman said the "overwhelming majority" of callouts were to non-violent events. The National Tactical Response Group and Tornado teams are armed specialists, trained to deal with situations including hostage taking. Officers were sent to Parc Prison, Bridgend 30 times (23 were responses to incidents at height), Berwyn, near Wrexham, 16 times, Cardiff five times but not to Swansea. Chief executive of the Howard League for Penal Reform Frances Crook said many prisoners were in "grossly disgusting conditions". "The problem is, if you put two adult men in a cell the size of a toilet, with a toilet and with nothing to do, day after day, for months or years, you're asking for trouble," added Ms Crook. She called for investment for better training for staff. "We want prison to be a place to behave better," she told Good Morning Wales. "At the moment, they learn to behave worse so they come out of prison and commit another crime." The figures obtained by BBC Radio Five Live showed the highly-trained specialist prison staff were deployed to 640 incidents last year, compared with 402 in 2014. An MoJ spokesman added: "The overwhelming majority of call outs are for non-violent incidents, including where they attended as a precaution and when the situation was resolved by prison staff."